Australia are unhappy over what they believe were a number of personal attacks by supporters on players that crossed the boundaries of decency. David Warner had a heated verbal exchange with a spectator at Newlands. Cricket Australia sent a letter of complaint to their South African counterparts on Friday over what coach Darren Lehmann called “disgraceful” verbal abuse aimed at his players by the crowd in the third test at Newlands. Australia are unhappy over what they believe were a number of personal attacks by supporters on players that crossed the boundaries of decency in a series that has seen heated incidents on the pitch. “I think it’s been disgraceful, you are talking about abuse of players and their families, it’s not on anywhere in the world,” Lehmann told reporters after the second day’s play. 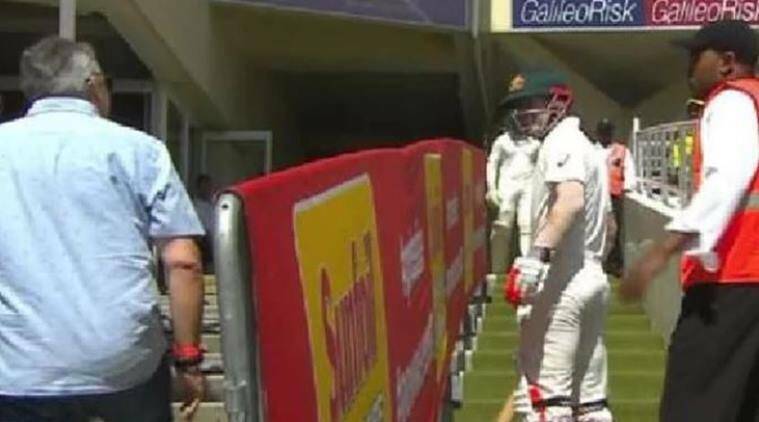 One spectator was ejected from the members’ area at Newlands when he initiated a heated verbal exchange with Australia’s opening batsman David Warner, who was climbing the stairs to the dressing room after being dismissed before lunch. “They (the crowd) have got to be better than that when they come to international events, it’s just disgraceful,” Lehmann added. “Not on this level, we cannot accept it anywhere in the world, talking about players and their families. Five players in the series have already been sanctioned by the International Cricket Council (ICC) for various contraventions of the organisation’s code of conduct, and it appears South African supporters have picked up on these cues. He served a volley of abuse in the direction of De Kock, which was caught on CCTV cameras in the players’ tunnel. The build-up to the third test was also filled with controversy as the number one bowler in the world, Kagiso Rabada, a home favourite, was initially suspended and then handed a reprieve after brushing against the shoulder of Australia captain Steve Smith in the second test. Australia are 245 for nine in their first innings, 66 runs behind South Africa’s total of 311. The series is level at 1-1.